The main colouring agent in Cosmos sulphureus is a pentahydroxy chalcone hexoside, an anthochlorine type flavonoid generically known as coreopsin. It is originally from Central America and belonging to the Asteraceae family. The Aztecs used it as their main dyes for yellow-orange shades, as it is mentioned in the 16th C. Florentine Codex compiled by Fr. Bernardino de Sahagún, where it is said that Xochipalli was the Nahuatl name for this dyes obtained from the petals of the Cosmos sulphureus which grows in Mexico. The main colouring agent in Cosmos sulphureus is the pentahydroxy chalcone hexoside. It is an anthochlorine type flavonoid generically known as coreopsin. However, colouring is also provided by additional flavonoids in the plant, such as isoquercitin and the luteolin glycosides. 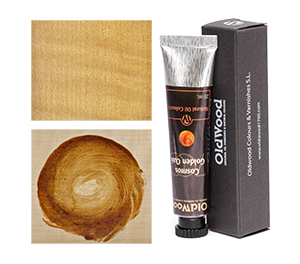 OLD WOOD processes these complex dyes to create two golden hues, one of them greenish with oaken nuances ( Golden Oak ) and the other more yellow with bright orange tones ( Golden Yellow ). Both are highly transparent, vibrant, warm and full of life. 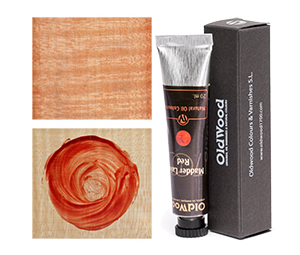 OLD WOOD processes these complex dyes to create two golden hues. Golden Yellow is the most yellow with bright orange tones.